In traditional Japanese woodblock printing the process is a successful collaboration between the artist, the carver, and the printer. 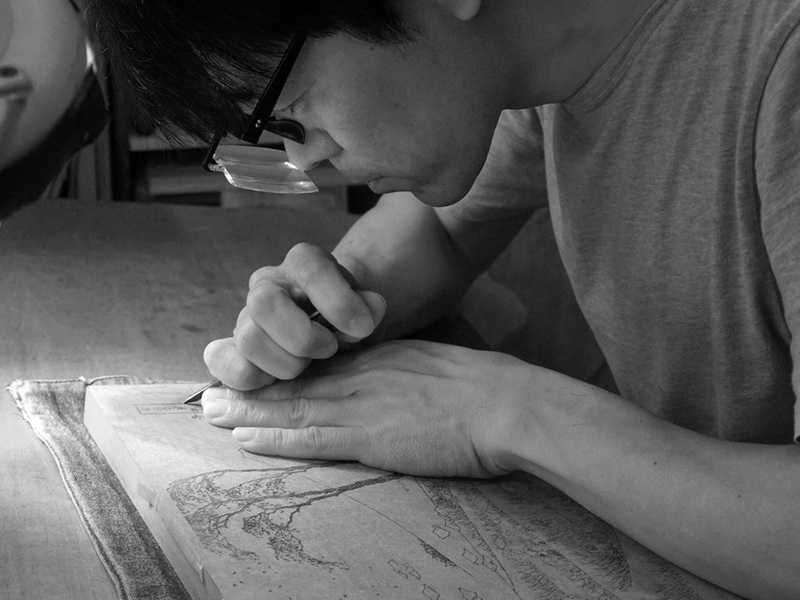 Kitamura-san is a master carver based in Kyoto who carves woodblocks for artists in Japan and around the world. Mokuhanga is the Japanese term for traditional woodblock printing, a technique that was perfected in Japan during the 18th and 19th centuries. 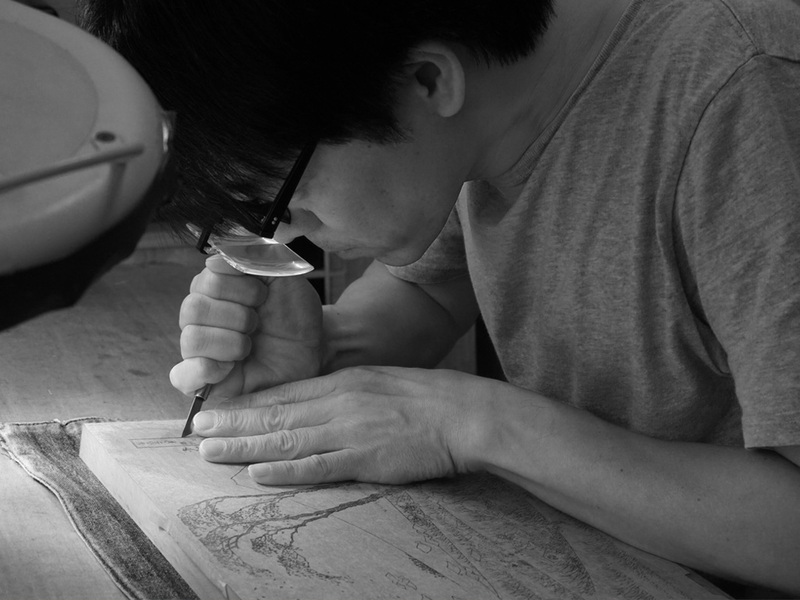 Kitamura-san’s work today reflects not only his skills but also the carving process that has developed over centuries. Its beginnings in Chinese precedents evolved into the refined multicolored Japanese woodblock technique during the Edo period (1603-1868). One of the most famous and iconic woodblock prints until today is The Great Wave painted by Japanese artist Katsushika Hokusai in 1830-1833. It was originally named Under the Wave off Kanagawa, from the series Thirty-Six Views of Mount Fuji published by Yohachi Nishimuraya. At that time it was made the print was sold for the equivalent of a double helping of noodles in the print shops of Japan. Over 5000 impressions were made by its print makers. It was popular in part because of the use of innovative Western style perspective. When Under the Wave off Kanagawa was created, Japan had been effectively in self-imposed isolation for almost 200 years; foreign influence and exchange was fiercely contested by the ruling shogun. There was only a confined selection of goods permitted to be imported or exported. Trade was only allowed with China and the Netherlands, restricted to a small port in the bay of Nagasaki (Kyushu Island/Japan), called Dejima between 1641 and 1853. Hokusai must have had the privilege accessing those rare paintings by European artist that made their way to Japan. 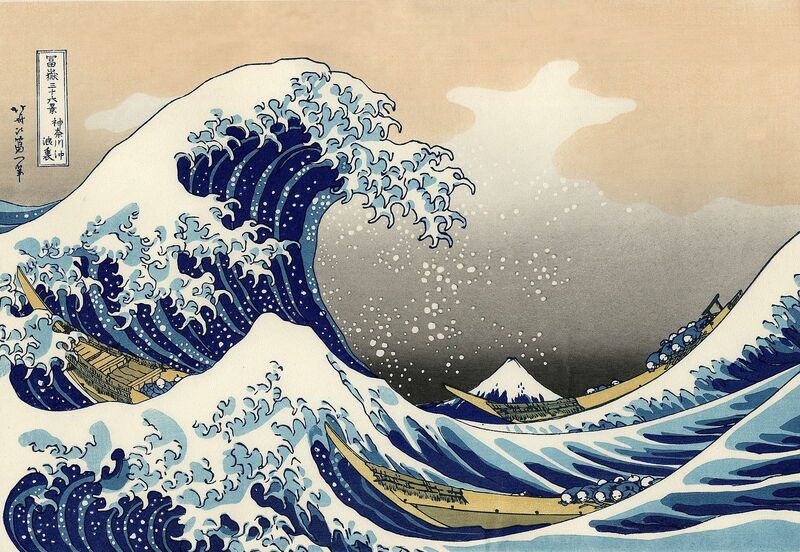 Art historians agree that Hokusai had studied European art as the composition of Under the Wave off Kanagawa clearly shows similarities to Dutch art: massive cresting waves in the foreground frame Mount Fuji in the center, tiny in the far distance. The carver’s challenge during production is to represent the artists’ drawing as accurately as possible in wood. For this he uses a set of various knives and chisels. He begins by producing a key block by pasting the master drawing face down to the block. He then outlines the brushstrokes with the knife, the hangi-to. After he will clear away the unwanted areas with different sized gouges and chisels, leaving only the drawing standing. It is astonishing to know that professional carving tools today are the same traditional tools produced centuries ago. Every single knife and chisel is still hand-made. It is a traditional craft itself that supplies the carver’s utensils to accomplish his work. Knowledge has been passed down from master to apprentice since the Edo period. Yet there is no specific technique that can be taught. One needs to develop his or her own carving abilities; the key to learning is simply observing the master and the use of materials, explains Kitamura-san. He vividly describes the way he learned the craft himself, starting mokuhanga by teaching himself, learning by doing, doing and failing for five years, until eventually he started an apprenticeship at the Gado publishing company under master carver Osamu Hotta-san. The key to perfect the craft he says is by experiencing and understanding the materials and the tools you work with. He would look at prints of old masters to understand their carving techniques, reading the prints on paper to understand the methods of printing and consequently the method of carving in wood. He has become an accomplished printer as well as carver solely he learned the printing process in order to develop his carving techniques. His expertise is the result of observation and practice, a tactile engagement with the materials, observing the character of the knife’s steel, the quality of wood, the fiber of the paper used for printing, the paper’s dampness during the printing process, and the character of the layers of color applied. Handling the material properly requires hard practice taking a full sensory assessment of all materials involved in the process, carving as well as printing. 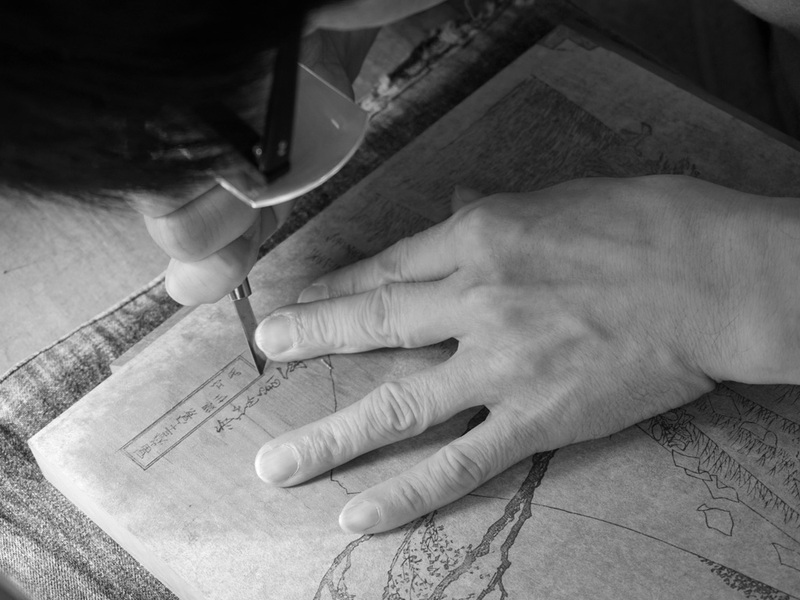 With time Kitamura-san skills became more and more refined, only by looking at specific details he then choose his method of carving accordingly. There is a similarity in the process to painting or sculpting. He notes that adapting to the production of contemporary artwork does change the outcome however the carving techniques do not change. Cutting deeper by questioning the future of traditional crafts, Kitamura-san responds with no hesitation that the old way of a master passing down his knowledge to an apprentice is vital. To retain the knowledge of any tradition observing the master at work and seeking his advice is fundamental to developing skills. He tells the story about how he learned over many years to perfect knife sharpening and that looking at the sharpened knives of the master helped him understand how to treat his own tools. What unique position can mokuhanga carve out for itself in the 21st century? It is a concern and a question that Kitamura-san is discussing with the few master carvers left and there is no clear answer. He feels a deep responsibility, he continues, to make sure people continue to appreciate and recognize Japanese woodblock printing. This way the essence of the craft will retain. Kitamura-san is a member of Kyoto Woodblock Printmaking Association and a vice-chair of Kyoto branch of the Ukiyo-e Woodblock Printmaking Association of Technical Preservation. He is available for collaboration with both Japanese and international artists and designers.